Should I Hire a Car Accident Attorney? This past Friday, December 26 the city of Dayton produced a rash of car accidents involving inclement weather. In the Miami Valley area of Ohio there were icy road conditions. This seems to have led to the rash of accidents. It was reported by WHIO in Dayton that there were multiple car wrecks. Near West Grand Avenue an automobile lost control and crashed into a stop sign. The Dayton city police were investigating. There were multiple people in the car and it appears if they were injured they would have a claim against the driver. ( See legal commentary below.) They also may need there own under-insured motor vehicle coverage if so many had injuries and the driver had little insurance. Later in the early morning hours a wreck happened at I-70 in Preble County, Ohio. 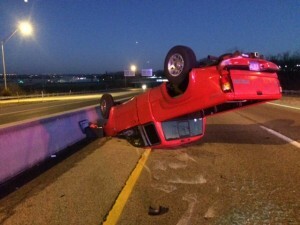 Apparently the driver was trapped in his car and emergency personal had to free him. Streets and ramps were closed. At south bound interstate 75 and interstate 675 the ramp was closed because of an accident. A car crash involving multiple motor vehicles happened at interstate 70 . A auto moving east crashed into the back of another vehicle near the cross street of Arlington road. the car that was hit crashed into the guardrail and another car came along and hit it. This may be exceedingly simple or entirely complicated to sort out responsibility to the car that was struck. The facts and legal research and medical opinions may be necessary to sort this out. On Ohio route 35 multiple crashes happened. One car rolled over the edge of the road. You may be wondering who is responsible for crashes on ice and snow in Ohio. The law is pretty clear. If you have been injured by someone sliding on ice and snow the insurance company may deny responsibility. They should not in Oho, as the law here is very clear. A motor vehicle skidding on ice or snow and causing a crash is not a defense to negligence. In Ventress v. Frambes, 176 Ohio State 333 the Ohio Supreme Court held that when a specific safety statue is violated then the only excuse to such violation is that a sudden emergency made it impossible to comply with the statute. A specific safety statute is one that prohibits specific conduct. For example, “you shall not drive left of center of the highway.” Thus, if you do and cause a crash you are responsible. The only excuse is unless there was a sudden emergency that made it impossible for you to comply. You may ask what is a sudden emergency. An emergency which will relieve a motorist of his duty to comply with a safety statute regulating vehicular traffic must arise as the result of something over which he has no control. A self-created emergency, one arising from the driver’s own conduct or from circumstances under his control, cannot serve as an excuse. Spalding v Waxler. Someone having a heart attack, with no evidence of heart issues or that a heart attack is imminent is an example of a sudden medical emergency. This could serve to excuse otherwise negligent conduct. Anthony Castelli is an Ohio personal injury lawyer with over 30 years experience . He offers a free consultation. To get his help call 937-306-6410 or 1-800-447-6548 Find out what it feels like to get help from a lawyer that cares. Attorney Castelli was on my side from the beginning. Everything he did was in my best interest. I highly recommend Mr. Castelli to anyone who has a serious personal injury claim. Thank you! Thank you so much for all of your diligent effort. Your personal attention to our case and the level of support were incredible. Every time I spoke with you, I felt like you were a member of our family helping us through a very difficult time. I can’t thank you enough. I was hurt in a motorcycle accident. It was an awful time for me. Fortunately, I hired Anthony Castelli as my lawyer. He answered my questions and dealt with the insurance companies. He really helped when I needed it the most and I highly recommend Mr. Castelli to anyone who is seriously injured in a car or motorcycle accident. I will be eternally grateful Thank you! Tony – Thank you so much for helping me after I got hurt. I was lost and didn’t know what to do. You took over and made sure I got what I deserved. I was very happy with my compensation. If any of my friends or family ever needs a personal injury lawyer, I will definitely tell them to hire you! Thank you! Happy Results! Mr. Castelli, thank you for everything! You got me results and I really appreciate it!